Topoisomerases, enzymes vital for cellular processes including replication and transcription, are the magicians of the DNA world. Responsible for uncoiling the tightly packed molecule, “they open and close gates in DNA without leaving a trace, and they enable two DNA strands or duplexes to pass each other as if physical laws don’t exist,” said Jim Wang, MCB professor emeritus and the enzyme’s discoverer. But how exactly do these enzymes perform their magic tricks? Wang spent much of his 40-year career uncovering the science behind the illusion, which eventually led to a better understanding of the enzymes’ crucial role in biological development and the discovery of new antibiotics and anti-cancer drugs. Described by his colleagues as a “brilliant but humble” scientist, his “pioneering, Nobel-prize quality work” no doubt helped define a generation of scientific research. Wang’s journey to becoming a prominent figure in the cellular and molecular biology field began in China’s Jiangsu Province. Born in 1936, his world was soon thrown into chaos by the beginning of the Second Sino-Japanese War the following year. Wang’s father left the family for the government’s wartime capital, Chongqing, and wouldn’t return until the war’s end in 1945. Wang’s education was often disrupted throughout the war, so his mother set up a school in her rural hometown of Liyang, which at the time was occupied by Japanese forces. “I became a second grader in her school, but she soon became very ill,” he said. Sick and running low on funds, Wang’s mother closed the school. “When she passed away a couple of years later, my childhood ended. I was six and a half.” His sister, five years his senior, would also pass away a few years later. Losing his mother and sister at such a young age was devastating, but Wang continued his education independently, reading any book he could get his hands on. “I benefited greatly from what my mother taught me about reading on my own, which allowed me to cope with the interruptions and deficiencies in my schooling,” he said. After the war, his remarried father returned to the capital of Nanjing, where Wang became a fourth grader. But impending civil war continued disrupting his education. Wang’s family moved to Taipei in 1949, where he finally attended school regularly. Wang arrived in the U.S. in 1960 to pursue a master’s in chemistry at the University of South Dakota, and later received his PhD in physical chemistry from University of Missouri. It wasn’t until a postdoctoral fellowship at the California Institute of Technology in 1964 that he was introduced to DNA. Wang’s decision to stay a second year at CalTech was a good one, he noted. He continued working on DNA ring formation and witnessed the discovery of supercoiled DNA—a structure that would eventually play an important role in his career—in the laboratory next door. Wang moved to UC Berkeley in 1966, where he focused on supercoiled DNA rings and made his most famous discovery. One summer day in 1968, Wang was called home to tend to his young daughter who had fallen ill with a fever. He was in the middle of an experiment investigating why rings isolated from natural sources negatively supercoil and rushed to prepare samples in the centrifuge before leaving. Wang didn’t properly adjust the temperature control and when he returned two hours later, the temperature in the centrifuge rose by nearly 20 degrees. A series of follow-up experiments confirmed Wang’s suspicion: an enzyme was responsible for uncoiling the DNA. He dubbed it ω, the symbol for angular velocity, in acknowledgement of his happy accident with the centrifuge that led to its discovery. Wang later renamed the protein DNA topoisomerase, a word he coined for enzymes that interconvert different DNA topological forms. Wang’s accidental discovery of topoisomerase set him on a new research quest that lasted the rest of his career. He joined Harvard in 1977 as a tenured professor, and continued elucidating the enzymes’ structure, function, and other properties—first in E.coli, then in yeast and mice. Before he could completely focus on topoisomerase, however, the phone rang. It was Francis Crick. When Watson and Crick discovered DNA’s double-helix structure more than two decades prior, they noted an “entanglement problem.” Cells are stuffed with DNA that if unwound would measure six feet in length. In order to fit inside the nucleus of microscopic cells, DNA must twist and then twist on its twists. When cells divide, the strands of a parent DNA double helix must uncoil to separate, duplicate, and segregate into daughter cells. During transcription, the RNA synthesis machinery moves along the DNA folds, potentially creating a tangled web. Because of these entanglement problems, some scientists questioned whether the double helix truly represented DNA’s structure in solution and living cells. Alarmed, Crick contacted Wang to help him prove the molecule’s structure once and for all. “The least anyone could do to pay their respects to a living legend would be to rise to his call,” said Wang. And rise he did. Wang not only confirmed DNA’s helical structure, he also found a way to measure its helical periodicity in solution. Wang found that topoisomerase I and II work by temporarily breaking strands of DNA, creating gateways for other strands to pass through. Type I breaks a single DNA strand to allow another strand to pass through, whereas type II breaks both strands and escorts them through a second double helix. “It’s a very clever enzyme, because it only transiently breaks DNA to solve the entanglement problem,” he said. Throughout the 80s and 90s, Wang’s lab continued to unravel topoisomerase’s many mysteries. They helped solve the three-dimensional crystal structures of various topoisomerase enzymes, allowing researchers to see them in action. And he found that a DNA-bound type II DNA topoisomerase operates as a molecular machine with two protein ports—one for admitting a second DNA and the other for its exit after it passes through the enzyme-bound DNA. In the mid-1980s, Wang took a sabbatical from Harvard and traveled to Nankang, Taipei. There he and colleagues helped establish a molecular biology research institute at the Academia Sinica, the most prestigious government-funded research institution in Taiwan. “I always thought I should contribute something to Taiwan to repay the free education I received there,” he said. Wang and colleagues made great strides, including sequencing a human gene encoding type II DNA topoisomerase, deducing that transcription is a major driving force for DNA supercoiling inside cells, and developing a powerful yeast genetic system for studying topoisomerase-targeting antibiotics and anti-cancer drugs. Intrigued by the enzymes’ potential importance to biological and drug development, Wang extended their studies from E.coli and yeast to mice models once back at Harvard. Using gene knock-out experiments, Wang demonstrated just how vital topoisomerases are to life. His lab found evidence of the enzymes involvement in brain and embryonic development, lifespan, and even hair growth. These findings raised more questions, especially about how topoisomerase affects gene expression, but Wang would not be the one to answer them. Wang’s research earned him numerous awards throughout his career. They include the National Academy of Sciences Award in Molecular Biology, the Distinguished Alumnus Award from the University of Missouri, and the Most Distinguished Chinese Scholar Lectureship from the Hong Kong Society of Scholars. 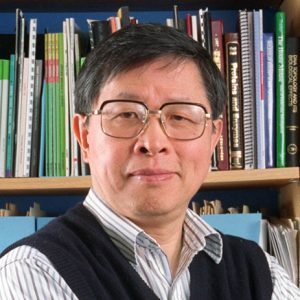 Wang is also an elected member of the National Academy of Sciences and Academia Sinica, an American Academy of Arts and Sciences Fellow, and an associate member of the Third World Academy of Sciences. Over the course of 40 years he wrote or contributed to more than 250 research papers and three books, some of which are considered definitive works in the field. Though no longer an active scientist, Wang still has his fingers on the field’s pulse. He wrote a book in 2009 about topoisomerases, Untangling the Double Helix, for the general public as well as those in the field, and recently co-authored the fifth edition of a textbook. Wang has been trying to wind down his scientific activities, however, and fully embrace retirement. He sometimes writes classical Chinese poetry for amusement, and recently published an anthology under a pseudonym. But he still occasionally studies papers his former colleagues send him—once a scientist, always a scientist.